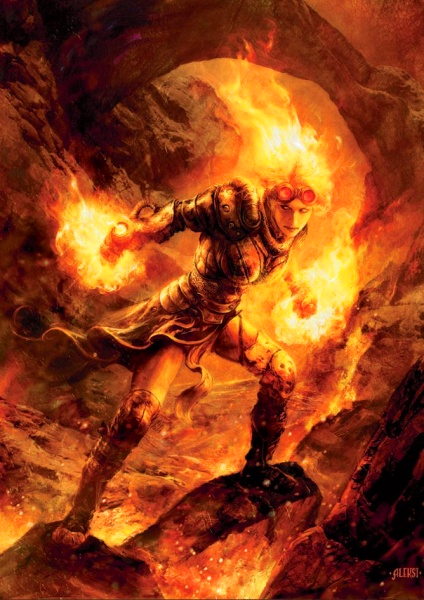 She's Fantastic: Magic the Gathering - CHANDRA NALAAR! 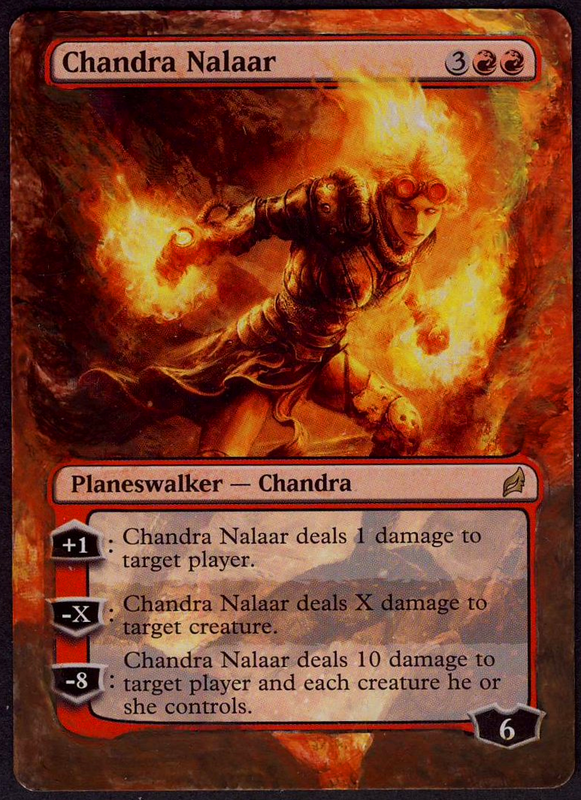 Magic the Gathering - CHANDRA NALAAR! I love saving the best for last. I think Chandra Nalaar is the standout figure from the first wave of Funko's Magic the Gathering Legacy Collection. 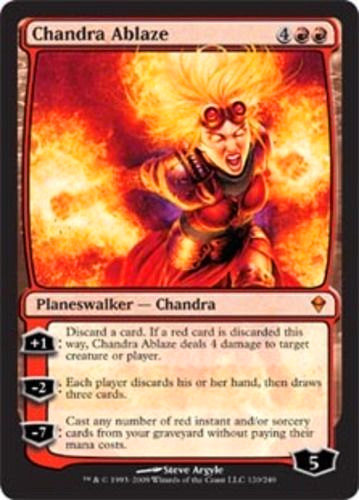 Chandra is a red-mana-wielding planeswalker with a specialty in pyromancy. I think you really can't go wrong with flame-hair on a steampunky figure. She reminds me a little bit of Nikki from the 1990 Guardians of the Galaxy series and a little of Doctor Phosphorus' daughter Tinderbox from the pages of Catwoman. Even though she's the least fantastical/mystical-looking of all the figures in this wave, she definitely has the most dynamic and interesting look. She also has no QC problems at all as far as I can tell. She's posed in a weird warped-leg stance in the packaging, but she can easily stand straight with some fancy articulation manipulation. With the undoubted success of this line, I'm hoping we see a series two with character like Serra Angel or maybe a Bitterblossom Fairy.. I just want wings, dammit! Let's check out Chandra Nalaar in detail below! Chandra's accessory is a really cool flame ball. It looks suspiciously like the Hot Toys logo (who happens to be the official Japanese distributor of these figures). The ball does not attach in any way that I can tell, and only rests in her palm. Here are some images of Chandra from Magic the Gathering cards and promotional materials. Time for some Group and Comparison shot! Here she is with Liliana Vess. And here's the whole group with Nissa Revane added. Hundred per cent agree in the comparison with Nikki. It defo is the better, slicker looking of the three. And my most wanted since the announce. I'm happy you didn't get any flaws. Hope mine doesn't either. But yes, it makes me want the original Guardians in marvel legends, so one day I can re enact the Korvac saga in a display. Funny thing is, I couldn't find a single picture of Nikki for this review where she didn't look ridiculous. My emeories are so much better than the reality. It's not unfeasible that we'd see classic GOTG as a future SDCC exclusive or something. I'm sure there will be multiple sequels and they'll eventually run out of obvious merchandising ideas. Okay, I'm officially addicted. I picked up Chandra earlier this evening, and I plan on picking up Liliana and Jace tomorrow at Barnes and Noble. 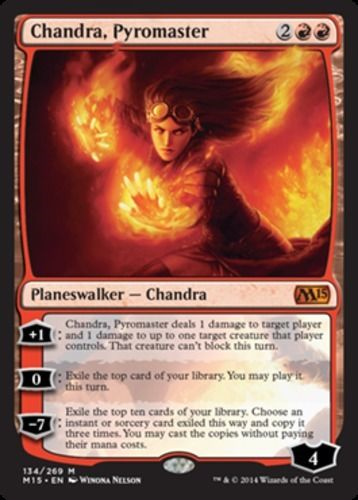 Now that I've researched the characters a bit, I wish they had given Chandra a variant "powered down" head with her red hair and green eyes. I may have to see if I can come up with something on my own. With these figures being so close in scale to Marvel Legends, there should be a few good options out there. One thing I'm excited about is the potential for colorfully-skinned ladies. I love characters with blue, green, or red skin and a fantasy series like this could be full of them. These toys remind of what I wish the Warcraft toys would have been. They were always too preposed for my tastes (although beautifully sculpted). These MTG toys are my biggest toy crush right now though. I'm really hoping Funko comes through and announces wave 2 soon. Kiora Atua and Elspeth have Pop figures that are already available for preorder. I figure it's just a matter of time until we here the offical Legacy announcement. So how did you manage to make her legs look straight instead of like she has to go to the bathroom really bad? Good question! I didn't do anything special (as far as boiling her legs or anything). I just rotated her legs slightly and I have one knee bent a little. You can see that in the side-angle shots. Yeah in the packaged she's a little knock-knee'd. Just play with the leg articulation a little bit and you'll get a good pose.